The primary fishing boat is a 30' Crest Family Fish Triple-Toon (a pontoon with an extra tube) with a 225 hp Four-Stroke Yamaha engine. 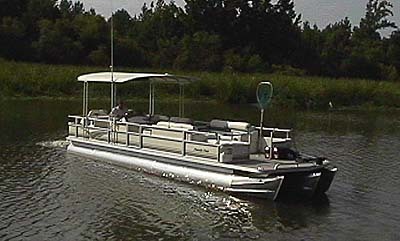 This boat and motor will quickly get you around the lake with the maximum amount of safety and comfort. Rod holders are placed along the front, sides, and back to enable up to twelve poles to be used at one time for drifting. Several chairs and cushioned bench seats give plenty of room for parties up to six, and the boat has an enclosed porta-potty for the convenience and privacy of the passengers. Enclosure curtains are used during rainy, windy, and cold conditions. Drift nets are used on windy days and a trolling motor is available to enhance the drift on calm days. Other boats and Captains are available if you have more than six in your party or you simply want to split up into smaller groups.